Hypothermia is a dangerous medical condition that can lead to death. It occurs when the body loses heat faster than it can produce heat. Construction workers who stay too long in the cold can suddenly experience a drop in their body temperature. 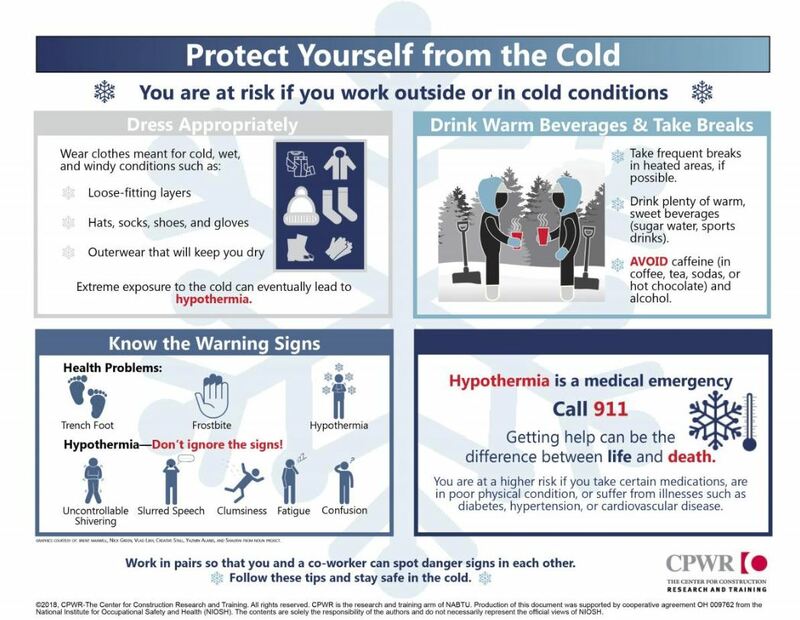 If a worker has uncontrollable shivering, if he slurs his speech or acts clumsy, confused or tired he probably suffers from hypothermia. Call 911 then bring the worker indoors. If necessary start CPR while warming the person. Give the person warm fluids if conscious. Frostbite occurs when the skin is exposed to extreme cold for too long and the skin and the tissue below the skin freeze. It usually affects fingers, toes and also the nose, the cheecks and the chin. Frostbite is a condition that should be taken seriously as severe cases can lead to amputation. Workers should check for signs of skin becoming very cold then numb, hard and pale. Mild cases can be treated with gradual warning but more severe cases require medical care.